Pivotal: transactions, Kubernetes, and taking an axe to long term support. I recently attended Spring One Platform (S1P), Pivotal’s annual developer and user conference, in Washington, DC. Pivotal had invited me to speak at their executive briefing conference, so the CIO access was really good. I came away with a few impressions I wanted to share. Customer after customer made it clear they are significantly increasing commitments to Spring and or Pivotal Cloud Foundry. Financial services, telcos, and retail companies that run serious transaction volumes are coming out of the pilot and proof of concept phases, and planning to start driving serious transaction volumes to PCF. Many of these companies have invested heavily in retraining their developer workforces, for example investing in Pivotal Labs training, and are now prepared to start using Pivotal’s software in earnest as a replacement for platforms including IBM WebSphere and Oracle WebLogic. There a few billion dollars of revenues to mop up in the Java middleware market. Agile training with Pivotal came first, now come platform commitments. One implication of this coming wave of transactions is that Pivotal’s margins will improve, as the software/services ratio starts skewing towards towards software and away from services. We’ll find out soon enough if this thesis is correct – as a publicly traded company Pivotal will be reporting on this stuff. Some of the customer names we know well from previous shows – Comcast for example, which has a solid workstream to come on the platform. Pivotal also has deeply entrenched wins at newer clients such as Rabobank, Merrill Corp, Kroger and StubHub. Boeing is also making deeper commitments to PCF, and I want to give the company a special mention – for commitment to diversity in its senior IT leadership, which is super refreshing. Meeting Ted Colbert, Boeing’s CIO and Niki Allen, senior director of strategy and ops, was a high point of S1P for me. Anyway – the signal here came from meeting about 20 different CIOs or senior architects over the course of a couple of days, all of whom were planning to deepen investments in Pivotal platforms. Not a comprehensive view of the market, certainly, but enough anedcote to start feeling like data worth considering. Regarding platform commitments there is definitely some pressure coming from the Kubernetes juggernaut in the Fortune 500. In any organisation, whereas some departments are looking for opinionated stacks, others want the kind of configurability and operational flexibility that comes with running their own infrastructure. Pivotal though has now made peace with the notion Kubernetes is going to start replacing some its own technology, pushing Cloud Foundry and associated technologies “up the value line”. 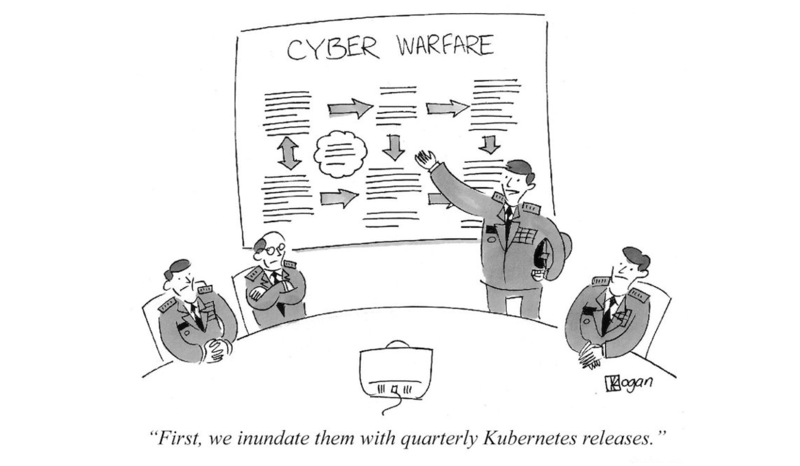 Kubernetes is coming, it’s going to be an enterprise IT mandate, and it’s a good stable foundation to build on top of, so why not embrace and extend? 2018 is the year when Pivotal started talking about Kubernetes without gritting its teeth. Cloud Foundry isn’t the only Pivotal product that will see some erosion from below. Pivotal plans to invest significantly in Spinnaker, Netflix’s Continuous Delivery platform, which has implications for its Concourse pipeline management platform. Last year Pivotal announced its riff function as a service platform. This year it announced that riff would run on Knative, Google’s open source serverless Kubernetes platform. Pivotal Function Service is commercial packaging of Knative and riff, deployable to PKS. Dave Syer, a senior consulting engineer at Pivotal, did a great job in the S1P keynote of arguing that we’ll see a pragmatic mix of different models depending on developer needs going forward. It won’t be a functions only, or container only world. There is a consistent theme here – provide value up the stack, package an opinionated open source stack of fast-moving open source components for customers. RedMonk has long argued that the key to success in software is packaging. It seems that Pivotal is leaning more that way itself. At the S1P analyst summit James Watters, Pivotal SVP strategy made a convincing case that new software delivery models are creating new challenges for enterprises and new opportunities for suppliers. He argued that continuous delivery of Kubernetes and other technologies creates a significant challenge for traditional commercial open source models based on long term support (LTS) packaging, just as much as it does for enterprise software development. There is a tension between continuous delivery and LTS, just as there is a tension between Agile and ITIL. This tension creates structural challenges for incumbents (notably Red Hat) and opportunities for other players. Who is going to help enterprises consume all of the new technology being created with such velocity? Even Java now has update releases every quarter. The old model of enterprises looking for stable runtimes that will last multi year time-frames is coming under increasing pressure, certainly with developer teams looking to take advantage of new functionality as quickly as they can. So Pivotal is more pragmatic, but the pragmatism has teeth (bared rather than gritted). Pivotal of course claims BOSH is the best platform to keep your fleet up to date with secure, software updates. Hearing it from a vendor is one thing, but a retail bank is another matter. Lance Rochelle, a Wells Fargo IT leader gave a great talk about how the bank runs rolling security updates – continuously rebuilding servers rather than patching them. Immutable infrastructure for security at a bank… It’s 2018. Which brings me to the axe. Nicole Forsgren, founder of DORA, spoke at the EBC about her research findings and new book, Accelerate. Read it, live it, do it. Rinse, Repeat. The TLDR is pretty straightforward – outperformers in software development not only deliver new functionality much faster than their peers, this functionality is also more robust and secure. Modern software development is not move fast and break things, it’s move fast and deliver stable things. This message has to be appealing for organisations seeking to improve development velocity, in that adopting modern practices doesn’t increase risk, it reduces it. The GIF above is Forsgren throwing an axe. She is certainly taking an axe to some commonplace, though incorrect, notions of software development and delivery. As the massive breach at Experian showed – because it was running an unpatched version of the Apache Struts framework – we can no longer feel comfortable if we’re running older versions of software, especially if there’s been a vulnerability notification. Currency is just as important as velocity. Pivotal remains a dominant player in IT transformation space. It now has the IPO behind it. The competitive landscape is becoming more complex, as is it’s partner ecosystem. It now competes with Google Cloud Platform pretty directly, for example, as Google started to sell GKE on premise to organisations such as HSBC. We’re going to see some churn. But importantly, Pivotal is showing more pragmatism as it moves up the stack. That’s all to the good. And the take on cracks in the LTS model is insightful. Pivotal paid for my speaking engagement, travel and expenses. Red Hat, IBM and Oracle are all clients. Pivotal is still struggling to deal with competition from Kubernetes. Its PKS offering falls flat due to it’s cost model and reliance on Bosh.